I’m so excited to be joining the amazing local girl gang behind The Lemon Collective for drawing night on February 27! This is literally a dream come true as I’ve been following their work since I moved to D.C. I hope you’ll join me in Holley’s beautiful new space on the 27th! I’ll will guide the group through a series of plant still life arrangements at She Loves Me, a flower shop in Petworth, featuring a variety of fabrics, textures, and, of course, cacti. We'll start quickly, with 1 minute drawings to warm up, and then increase the time you have to sketch each arrangement as the night progresses. NO DRAWING EXPERIENCE NECESSARY. This is a fun relaxed evening of casual drawing with people you might know, people you've just heard of, people you've stalked on instagram, and perfect strangers. IT'S GOING TO GREAT. 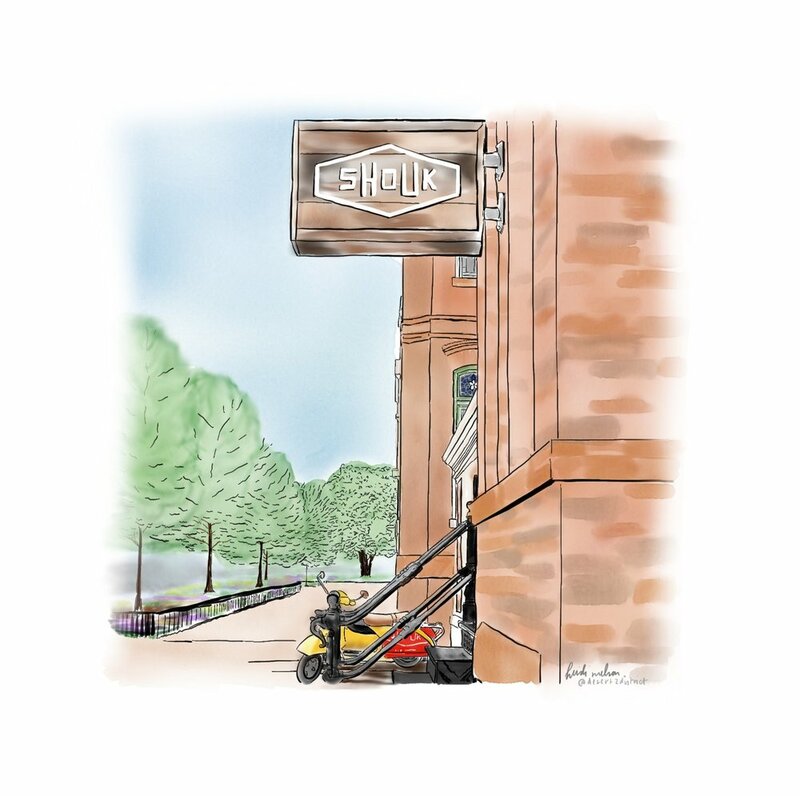 This week’s D.C. illustration is one of my favorite fast casual spots in the city: Shouk! Desert 2 District Design II Shouk Restaurant in Washington, D.C.
Shouk serves modern Israeli street food and all of it happens to be vegan. There are so many delicious items, but a few of my favorites are the cauliflower bowl, breakfast bowl (featuring an “omelet” made from chickpeas) and the chopped salad. The polenta fries are also delicious and unique. If you like spice, their Harissa sauce is a great addition to any of their dishes. The location I illustrated is their original, located on K Street NW, in between 6th and 7th. They also recently opened a location in Union Market. Let me know if you check them out! This week’s D.C. illustration is a new favorite of mine—Elizabeth’s Gone Raw! Ever since I went vegan about a year ago, I have been wanting to try this restaurant, which offers a raw vegan tasting menu every Friday. We celebrated two years as D.C. condo owners in June and Elizabeth’s Gone Raw was the perfect place to celebrate. I was totally blown away by each course. My non-vegan husband was equally impressed by the variety and depth of flavors throughout our meal. The setting is also very classic, yet homey, and the service is exceptional. I can’t wait to go back and think this will be my go-to celebration spot from now on. Scroll through a few of the dishes we were served during our visit. The menu changes constantly so you’ll always be trying something new with each visit. Thank you for a beautiful meal, Elizabeth’s Gone Raw! Weekly D.C. illustrations are back and I’m starting off with one of my neighborhood favorites— SUNdeVICH! Desert 2 District II SUNdeVICH sandwich shop in Washington, D.C. Although our neighborhood has a great selection of higher-end eateries and bars, there are a limited number of fast casual or takeout places. Luckily, the small selection we do have is excellent and that includes this neighborhood sandwich shop. As a plant-based eater, the menu options for me are a little limited, but I LOVE the veggie options they do have. I almost always order the Cairo, which has hummus, cucumber, brined veggies and walnuts. It. Is. Delicious. I have been assured by my omnivore husband that the meat options here are also excellent, so there’s something for everyone. I also appreciate that SUNdeVICH works to keep things local, with local, fresh-baked bread and locally-sourced produce and meat. They even have their own veggie and herb garden on their roof. Have you been? If so, what’s your favorite sandwich? I also love getting your recommendations! As you'll know if you follow me on Instagram, I am a huge cat lover. My husband and I have adopted two cats together--Data and Mo--from different animals shelters in Arizona and D.C. and I love to support animal adoption and organizations that help homeless animals. Naturally, I've been in love with Crumbs & Whiskers, D.C.'s first and only cat cafe, since it opened and I'm so happy to spotlight them today! 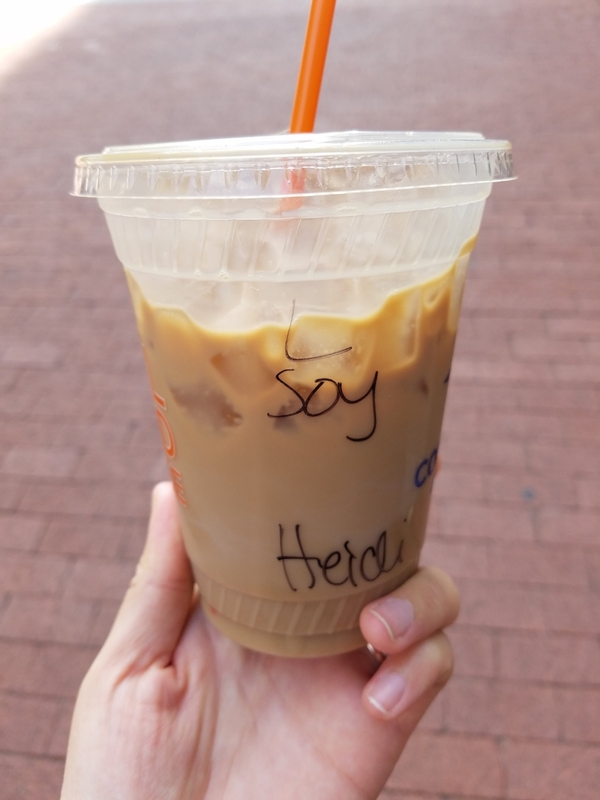 Not only is the cafe beautifully designed, light-filled and full of friendly staff, adorable cats and punny merch and coffee drinks (I loved my "Meow You Doin" coffee sleeve! ), but they also do so much to improve the lives of homeless cats. To date, they have gotten 627 cats adopted, donated $22K to animal charities, and saved 1,394 from euthanasia. They also give cats a lovely home while they await adoption. All of the cats at the cafe are available for adoption--and believe me, it'll be hard to not fall in love with one of them while you're there. This week's spotlight is a new favorite of mine. This company has multiple D.C. location, but each one is unique, and the one I like best and that happens to be in my neighborhood is Farmers & Distillers. The company itself is very unique, with an emphasis on family farms and sustainability. The company is majority-owned by family farmers. At this new location, there is also a craft distillery and they serve signature cocktails with their own liquors that are made on-site in the middle of the city. Farmers & Distillers is located on Massachusetts Avenue NW near Chinatown in Washington, D.C.
My Impossible Burger, complete with vegan bun! One major reason I've become obsessed with this restaurant is that they are one of the few locations in the city that serve the Impossible Burger. As a fairly new vegan, I still have meat cravings every now and then, and this "burger," which is made completely from plants, TOTALLY satisfies it. Even my omnivore husband prefers it to their regular burgers. It is so. good. And it makes me happy that this restaurant serves it and is has created a menu that can also cater to people with different dietary restrictions. I highly recommend trying it, but even if you're not interested, Farmers & Distillers has a huge, delicious menu, which makes it the perfect place to go with bigger groups or to take people from out of town. Let me know if you go and, in particular, if you try the Impossible Burger while you're there! The first day of spring was earlier this week and, even though it snowed that day, it got me excited to visit one of my favorite places in D.C.--Olde City Farm & Garden. The farm and garden, located on Rhode Island Ave. NW in Shaw, is the perfect outdoor oasis in the middle of the city. I love to go there get away from city life and wander the rows and rows of plants. It's a large space that's full of all kinds of plants--from vegetables to flowers to trees for your landscaping project--and extremely knowledgeable and kind staff. They love what they do and it shows. Their selection also changes with the seasons so you can get pumpkins in the fall and a fresh Christmas tree in the winter. They also are a wonderful community space as well and they host all kinds of fun events, including yoga classes and arts festivals. You can find me there a few times a year during their festivals, along with other awesome D.C. creatives and local businesses. I'll be updating my fairs & events page with upcoming events soon if you'd like to follow along. The farm and garden is still closed for the winter, but you won't have to wait long to visit. They reopen at 9am on March 31st. Can't wait to stock up for my spring garden! Last week, we went to Morris American Bar on a date and we are hooked. We love the whimsical yet classical design, the ambiance and music and, of course, the cocktails. Located in the Shaw/Mt. Vernon neighborhood of Northwest D.C., Morris is tucked away on 7th Street between New York and L in the Convention Center. It's a small, intimate space that you could miss if not for the fantastic sign that I painted above that greets you and points you in the right direction. We were seated at a little table in the corner with the BEST hooded rattan chair and a great view of the bar. I love how everything in the bar is this lovely baby The service was fast and attentive. We ordered from the menu (which changes monthly), but they also offer to make a custom drink for you based on your tastes and preferred spirit. My husband got a play on a Manhattan that was fantastic and I got a champagne mojito. I had never thought that mint and champagne would go together, but it was delicious and would be perfect for a sunny day. We love this new spot in our neighborhood and will definitely be back to try next month's cocktail menu. I'd definitely recommend stopping in for a cocktail for or two!